Lehigh Valley, PA – The Philadelphia Flyers, parent club of the Lehigh Valley Phantoms, have loaned forward Mike Vecchione to the Phantoms. A 24-year-old forward from Saugus, Massachusetts, Vecchione is entering his first professional season following an impressive four-year career at Union College where he compiled 71 goals, 105 assists and 176 total points in 149 games with the Dutchmen. 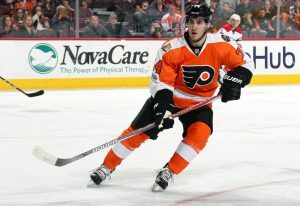 He was a member of Union’s National Championship team in 2014 (along with Flyers’ defenseman Shayne Gostisbehere) and was named ECAC Hockey Player of the Year last season after recording 29 goals, 34 assists and 63 points in just 38 games. The Phantoms’ 2017 Training Camp is currently underway and is proudly presented by People First Federal Credit Union. Another thrilling season of Lehigh Valley Phantoms hockey at PPL Center will be here before you know it with the Home Opener for the 2017-2018 regular season set for Saturday, October 7. And fans can catch their first glimpse of the 2017-18 Phantoms during a pair of preseason games at PPL Center on Friday, September 29 and Saturday, September 30 against the Charlotte Checkers. Tickets for both Friday and Saturday’s preseason tilts are available now and can be purchased online at pplcenter.com, by calling 610-347-TIXX  or in-person at the PPL Center Box Office [701 Hamilton Street].